I've been toying with the idea of adding vests to the shop after making this one last December. I hesitated (time constraints! ), and hemmed and hawed, until I received a special request for vests to match this tropical tie purchased for an upcoming summer wedding. I was so excited by the opportunity I immediately said yes and got to work. 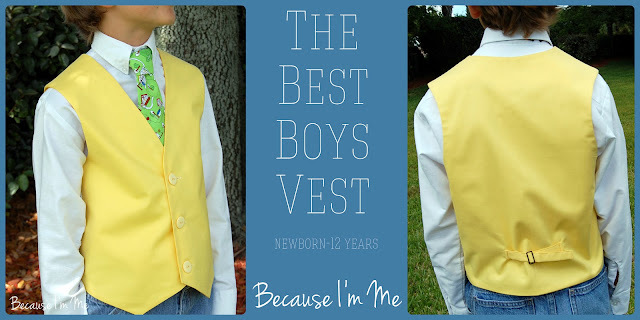 That is how the boys vest came to be. The vest is fully lined, in a coordinating solid. It has three buttons up the front and a belt in the back, allowing for adjustability. I am offering the vest in the shop in a seemingly endless array of Kona cotton colors. Of course, prints can and will be done just as easily per request. As soon as I get the post put together I'll be sharing the most incredible simple trick I learned for flawlessly cutting open buttonholes!